Mr Fairlie stepped down from his two Michelin-starred restaurant at Gleneagles last year. Renowned Scots chef Andrew Fairlie has died after a long battle with illness. Andrew's parents Jim and Kay confirmed his death with "enormous sadness" on Tuesday morning. The double-Michelin-starred chef announced in November that he was stepping down from his restaurant at Gleneagles after being told he had no more treatment options for a brain tumour. His wife, Kate Fairlie, and daughters, Ilona and Leah, said they were "utterly heartbroken". First Minister Nicola Sturgeon was among those to pay tribute to the 55-year-old. In a statement, his family said: "We are so thankful we had this extraordinary man in our lives. "He was a beautifully kind, generous loving son, father, husband, brother and friend, and enriched the lives of anybody lucky enough to meet him. "He has taught us so many lessons in life, not least to be kind. "He worked incredibly hard and his favourite thing to do was to create magic for us in the kitchen at home. "We will miss his calm, wonderful spirit, his cheeky sense of humour and his loving nature." Perth-born Mr Fairlie had been fighting the illness since 2005 with chemotherapy, radiotherapy and surgery but was told in June no further treatment was available. He announced in November he was stepping down from Restaurant Andrew Fairlie to arrange his wedding and spend time with friends. The keys were handed over to the head chef Stevie McLaughlin, general manager Dale Dewsbury and his business partner Gregor Mathieson in February. In a statement on the restaurant website, Mr McLaughlin and Mr Dewsbury said: "We are heartbroken that Andrew has gone, and our thoughts go out to Andrew's wife, Kate and his family. "We will miss him terribly, but will take strength and huge pride in continuing to burn the flame of outstanding cuisine, service and culture that he established." In a newspaper interview when he stepped down, Mr Fairlie said: "Giving up my restaurant kitchen was the hardest part. "The fact that I'll never be back, never have that buzz and atmosphere of the kitchen again, was very emotional. "But it's dangerous for me to be there. I'd just be a liability." He added: "I had so many sleepless nights worrying that my life's work would turn to dust. "My worst-case scenario was that Gleneagles would take back the space and give it to some other chef. "I am very grateful that it is not the case and that my legacy will continue." Mr Fairlie grew up in the Letham area of Perth and began training under local chef Keith Podmore at the of just 15. He was awarded the first Roux Scholarship aged 20 and trained in France before returning to the UK. In 2005, he cooked for the Queen and 44 world leaders during the G8 Summit at Gleneagles. First Minister Nicola Sturgeon: "I'm so sorry to hear that Andrew Fairlie has died. My deepest condolences to his family. Andrew is gone far too soon, but his achievements will always be remembered and his legacy will inspire the next generation of world class chefs. It was a privilege to know him." Broadcaster Stuart Cosgrove: "So sad to hear of the death of Andrew Fairlie. He grew up in Letham as a near neighbour. We often met up in Glasgow to reminisce and to imagine a better Scotland. Rest in Peace Andrew." 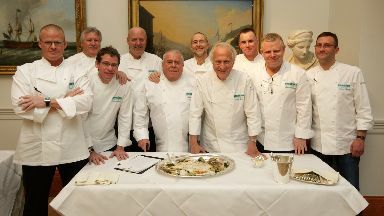 Celtic Football Club: "We are saddened to hear of the death of Andrew Fairlie, Scotland's only two-star Michelin chef and passionate Celtic man. The thoughts and prayers of everyone at the club go out to his parents, his wife and all his family and friends at this sad time." Former first minister Alex Salmond: "Dreadful news this morning that Andrew Fairlie has passed away. He was a world ranked chef of outstanding gifts, a fine patriot but above all a human being of great courage and loyalty - condolences to Kate and all of the Fairlie family." 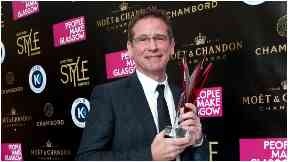 Gleneagles Hotel: "We are deeply saddened to learn our friend and colleague Andrew Fairlie passed away this morning. "Andrew was a treasured part of our Gleneagles family, and he will be missed terribly." Chocolatier William Curley: "Very, very sad news. Andrew was an inspiration, a great chef and a lovely person. He will be missed by all." Former footballer John Hartson: "Sorry to hear Andrew Fairlie has passed away.. Beautiful restaurant at Gleneagles, brilliant Chef and true gentleman, thoughts are with the family and close friends of Andrew." Lady Michelle Mone: "I'm so sad to hear that Andrew Fairlie has passed away. Andrew was one of the best chefs of our time, incredibly funny and just a great guy. God bless Andrew...you will be sadly missed." Former First Minister Jack McConnell: "Heartbroken for the family of ⁦@AndrewFairlie1⁩ - lovely man, outstanding chef and proud Scot. I treasure the moment introducing him to the G8 leaders who were gushing in their praise of his food. Too soon." Former boxing champion Alex Arthur: "So sad to hear of the passing of my friend Andrew Fairlie. Scotland has lost one of our best."